This modern condo in the center of all outdoor activities will sleep up to 6 in super-comfy beds. The kitchen is fully stocked for anyone who likes to cook, and there is a gas grill on the veranda. We are just steps away from the Centennial Trail inside the Riverstone district of Coeur d'Alene, 5 minutes to the Kroc Center and 20 minutes to Silverwood Theme Park. A 15-minute bike ride or 5 minute car ride from Sherman Avenue, the heart of downtown Coeur d'Alene. Three ski resorts are within an hour's drive. The famous 'floating green' at Coeur d'Alene Resort is just a few miles down the road. We came to this area with the Air Force in 1996, and loved it so much, we decided to stay. We're the happy parents of two sons, two daughters, a son-in-law, daughter-in-law and two fabulous grandsons. 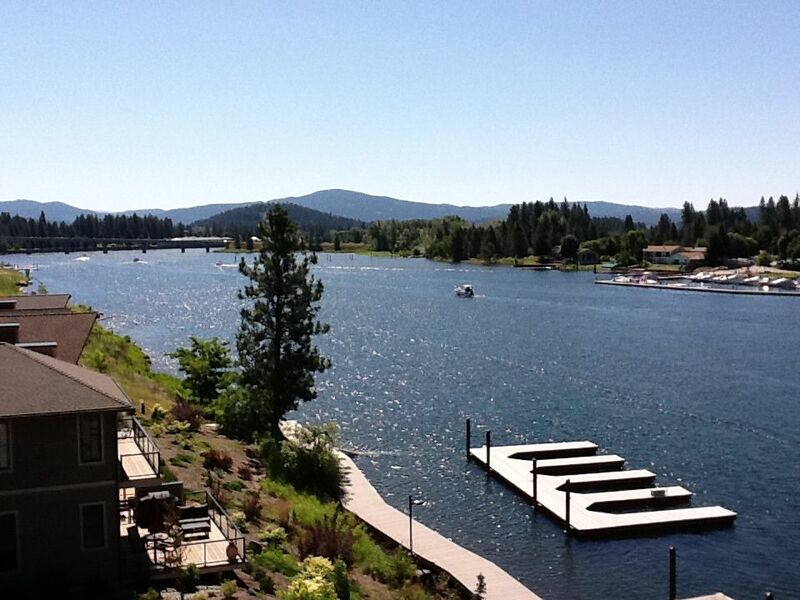 We purchased this property close to work so we could come and enjoy the gorgeous Spokane River and Lake Coeur d'Alene. This condo is only 20 minutes from our home, but it always feels like we've gone on vacation when we stay here. We hope you enjoy it, too. Stayed at this complex 4 times. It’s a perfect location. Thank you for your review. We love having repeat guests! The condo was very nicely appointed. The master bed was very comfortable. I wasn't able to watch t.v. because I could not figure out how to work the television. Written directions would have been helpful! Also, it took me a while to figure out how to get from the garage to the condo. Again, written directions telling you where the elevator was would have been helpful. The biggest disappointment was serving dinner to my friends in bowls that were all chipped. There were five of us and each of us had a bowl that was chipped. For the price I paid, I would have thought the dishes would be in better shape. One of the fry pans was so disgusting there was no way I would have used it to cook. It needs to go in the garbage can!! If one is looking for a nice, quiet place to relax on the deck, this condo doesn't fit that bill. The outdoor seating area for La Peep restaurant is below the deck and it was very loud on Friday night and Saturday morning. The condo was clean except they really need to clean the vent at the bottom of the refrigerator - - it was disgustingly dirty! I almost cleaned it myself. Not sure the value was there for the price I paid. Thank you for your feedback. We're so sorry to hear that your stay was not as expected. We've taken your suggestion and now have written directions by each television. We hope that outside of these issues you were still able to enjoy your visit to Coeur D'Alene. We loved our stay in this condo. It's in a fantastic location, and the views are gorgeous. Plus, the beds are so comfortable! We enjoyed strolling along the floating boardwalk and having breakfast by the water at the onsite restaurant. We would definitely stay here again. In fact, we're already planning another visit for next summer! So glad you had such a wonderful visit. Looking forward to seeing you next summer! Our family really enjoyed our stay on the Spokane River. The condo was perfect and well-equipped. Thank you so much for your review! Glad to hear you had a great time at the condo and Silverwood. We try to be as accommodating as we can and we're so happy to hear that it was helpful for you. Excellent accommodations and perfect location to everything. Can’t beat the view! Strongly recommend! Excellent stay. Checked out the area and may be purchasing a home in Coeur d’Alene. I'm so glad you enjoyed your stay, and I do hope you end up in Coeur d'Alene! Good luck to you and God bless.